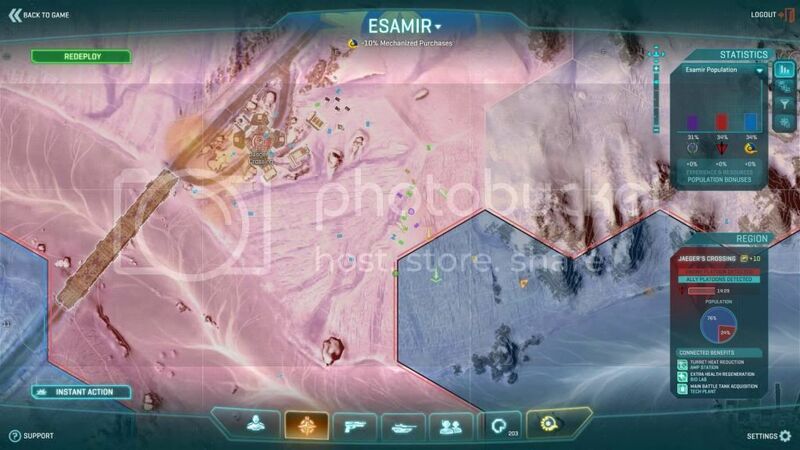 A good night on Esamir. 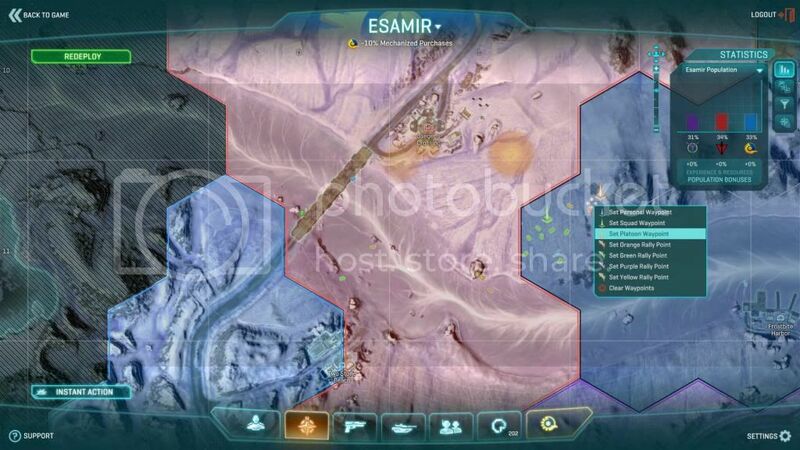 TGRandy was running a training squad (Bravo) while I kept two other squads supporting the objectives I gave Bravo. My hope was to demonstrate to the trainees the way a TG platoon stays together while Randy undertook his training agenda. 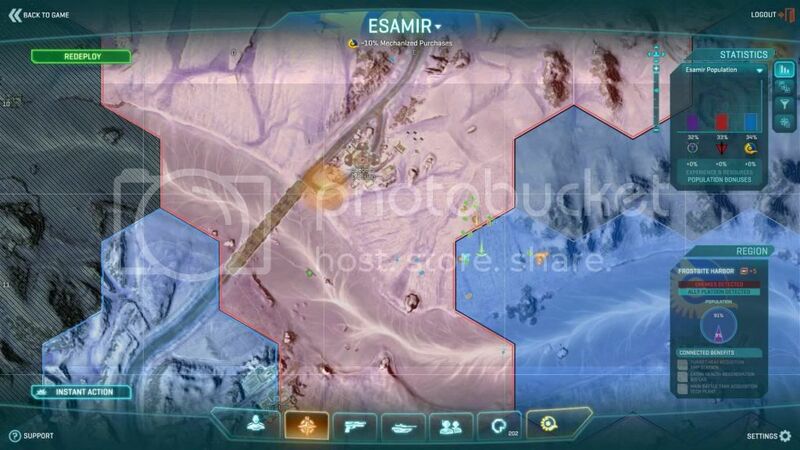 Here are a series of images that document one battle. At one point I had Charlie holding the West flank, Bravo in the middle, and Delta on the East flank as we assaulted the objective to the north. I recall seeing about twenty to forty enemy soldiers rush our amour line -- which lead to a hasty retreat and regroup, from which we eventually recrossed the ice river and took the objective. Squad leaders please remember to ALWAYS give your PL a "Copy" when you are issued any order. My goal was to keep platoon comms to a minimum and ensure that we assaulted targets as a cohesive platoon. Last edited by E-Male; 04-25-2013, 09:29 AM. I was recording the major battles throughout the night. Ill make a quick video tonight when I get home from work. Also I want to say that I had a great time playing last night. I may not be the best shot but Ill do my best to support the squad im in as a engineer. Do you have any feedback on the training experience? 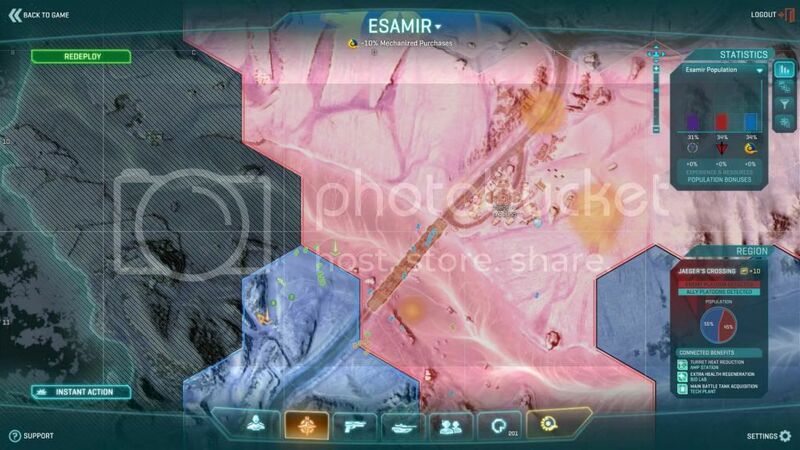 Overall Randy did a great job leading bravo using infantry tactics/ formations in every encounter be it with vanu or TR. I also liked how he would explain why he had us do certain things using examples. The only negative comment I have is regarding the comms. There were times when Randy would have to say "clear cooms" multiple times. He later addressed the issue and everyone in the squad cleared comms when he asked for it. I always have a great time when under the command of Randy. Maintaining comm discipline is one of the more difficult tasks. Randy does a great job of keeping things in order. I really enjoy applying basic military infantry tactics to PS2 as a Squad Leader. Keeping the squad together; reporting, moving to, engaging, if necessary breaking contact; setting us up in advantageous firing positions (bringing more rifles to bear on the enemy than they were on us, using terrain to our advantage). It takes some time and a slight initial amount of hair pulling (generally speaking, not last night, as I stated my goal for the evening early) but I believe the effort is worth it as you can not only defeat enemy numbers greater than yours, but you are also getting the most out of all skill levels of squad members. Within this format, twitch shooting skills are not required, as even a relatively new player or one who is not the best shot can be an effective part of a rifle squad. Also, I think very few (if any) other squads do this in game, we routinely mow down steady streams of enemies as they come trickling into the room or area we have our base of fire set up 1, 2, or 3 at a time and run into 8-12 guns all shooting at them at once. As ghostshooter101 points out, we did have a couple comms issues, but I consider this also part of the basic training. The typical excited "there's a tank, A TANK A TANK!!!!!11!!!!.... I'm dead" with no bearing, distance, etc. which I used as an opportunity to explain what a correct (and useful) contact report entails. Also, one individual in particular sounded like a younger guy and I didn't recognize his name as being in our Outfit. He seemed very excited to be playing with an organized group but again the typical too much comms chatter and not useful contact reports (i.e., high noise to signal ratio). I tried to take him aside in prox at one point (so as not to embarrass him) but he apparently had his prox volume all the way down and could not figure out how to adjust it. The whole rest of the squad was loaded up in the Sundy already so I finally just had to say what I needed to say to him in Squad. I tried to do so in as kind and instructive a tone as possible. After that he did pipe down quite a bit, I hope I didn't hurt his feelings and I hope he finds his way back to one of our squads some time. Some times it can be slightly (or greatly!) frustrating dealing with newer players (or even experienced PS2 players, who are not used to moving in organized formations) in the heat of battle. On these training nights though, I took some good advice from BigGaayAl. I put "winning" the in game objectives aside for a moment and instead focused strictly on the proper employment of the tactics in and of themselves. And I stated this was my goal to the squad early on in the evening, and again later when I noticed we had a few new names in the squad. Once I got the squad to buy in to this approach, a funny thing happened, our effectiveness in game actually went up exponentially. I really enjoy sharing my knowledge of basic infantry tactics with the newer players, and seeing them change over the course of the evening from a bunch of undisciplined marshmallows at the outset into an effective, cohesive, and lethal fighting force. :D I also see that we have a lot of new members joining our Outfit lately, some of which are new to the game and others of which may just be new to our style of applying tactics. So to that end, I will continue to run training squads as frequently as I think is necessary for as long as I feel there is a need for such classes. My hope is to get all of the new guys versed in the basics until they feel comfortable (with additional in game experience) to perhaps run a squad of their own one day. In the future, I think I will limit the squad recruiting to "Outfit only." By the time I thought to do this, the squad was not only full but stayed full the whole evening, for the most part with the same group of guys the whole time actually. I had a really good time, and I think my squadmates did too. I call it "homework" because it should be read and digested before our next training class. It is a really good discussion thread, only one of many here at TG. There really is a treasure trove of information here if you look around for it. People often ask me if I was in the military. No, I was not in the military, but I have been interested in the study of military history almost my whole life. I also learned a lot of things about how that applies to the games we play right here at TG. But back to the thread linked above. In it, Wicks (one of our long time members and a great shooter and leader I will always remember from BF2:PR) lays out some basic infantry practices. Some of them overlap the same things I was trying to teach in class, but others are more cerebral concepts that can not be easily conveyed in an in game setting, even if it is a "class" type setting. So I highly recommend reding that entire thread for anyone who wants to increase their skills as a basic infantryman, or if you have thoughts of maybe Squad Leading one day. 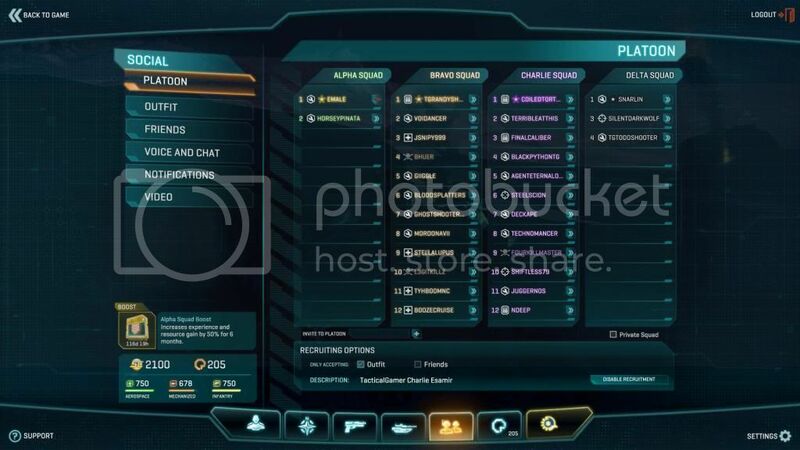 Also, for those interested in these sort of topics, currently there is a Planetside 2 Round Table event scheduled for this Saturday, the topic of which will be "How to be an Effective Squad Member." The event will be in TeamSpeak, for all the info about it check out the linked thread. I'm having a little trouble posting the link to the video. Just add www. in the front. This is the footage that I gathered throughout the night. I just got fraps so all my future videos will have comms chat. Thanks ghost for posting the video! Maybe you are too new to the forums (too few posts?) to post a video? Not sure. But anyway here it is. 00:01-01:02 Grouping up at warpgate, pulling armor. 01:02-01:53 We left our warpgate and headed NW to the southwest side of the bridge south of Jaeger's Crossing. 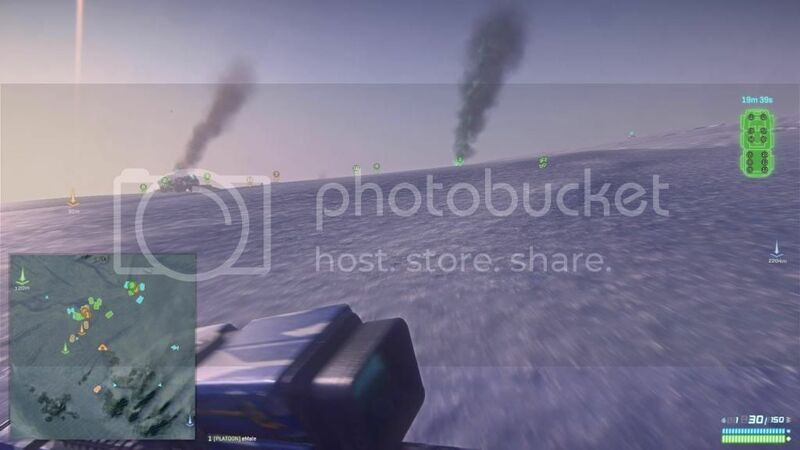 We stopped there in order to shell the enemy from long range. This is something I have noticed phaelah and Knifewise doing as they employ armor very well (and I have been taking notes :)). Incidentally, I think it is time we start running dedicated armor squads on the evenings we have a lot of tankers present, just as we do with dedicated Air squads on most evenings. I know from talking to people and playing with them we have a lot of guys interested in tanking. Sometimes it is hard to get them out of their tanks, even when you are running an infantry squad. lol So just let them run a dedicated armor squad. Because they are interested in tanking, they usually have some upgraded tanks as well. Personally I find tanks confining and would much rather run an infantry squad. I know there are others out there who are also averse to tanks for the same reasons, we feel uncomfortable in them. But I will pull armor if asked, because we follow a CoC. But why not let all the tankers just do armor? This way, everyone gets more enjoyment out of the game by doing what they would prefer to be doing anyway, and we enjoy the benefits of a dedicated armor squad. I think I will make a post on this in the General area in fact. 01:53-03:08 We push the enemy back across the bridge, and eventually move to the east side of Jaeger's Crossing to continue our shelling of that tower. We deploy our tanks using the reverse slope defense, pulling back down our side of the crest when repairs or re-arming are necessary. 03:08-04:05 Everything was going pretty well until Black Widow Company [BWC], most likely led by Buzz Lightyear himself, all of a sudden started pouring out of the eastern part of Jaeger's Crossing and across the snow, charging our position. There must have been platoons of their infantry, they came on like a tidal wave in volume as well as force. 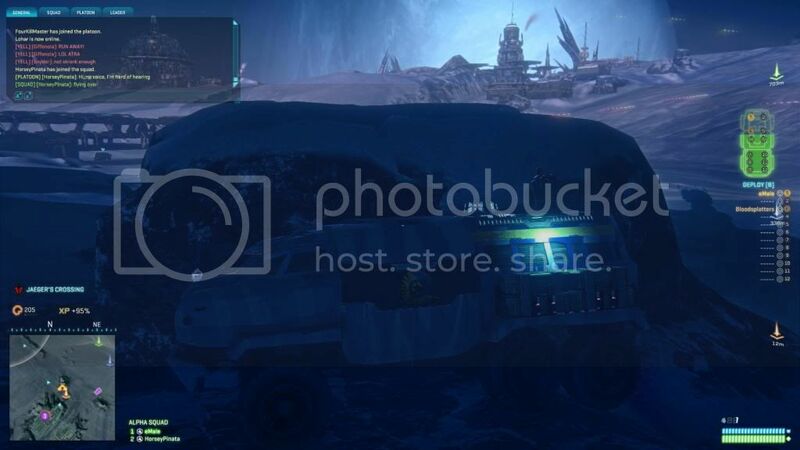 We were forced to withdraw to Frostbite Harbor, to the southeast. Not shown in the video, I think it was somewhere in here that we had our first battle at The Pit, the one where platoons of their infantry poured out of the spawn as we were just about to cap. More on this in the last paragraph. 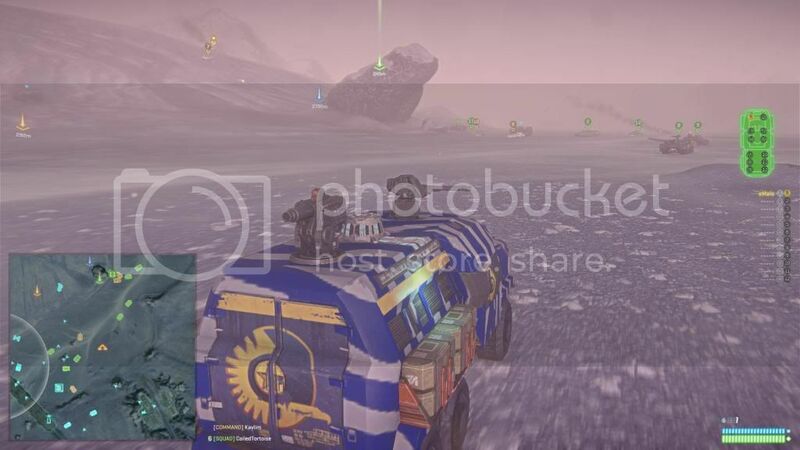 04:05-05:31 We continued to battle BWC across the snow around Frostbite Harbor. 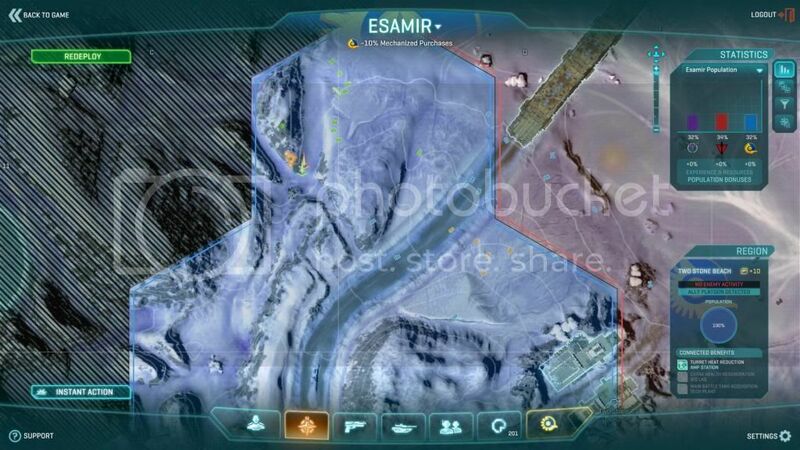 We kept getting pushed off of objectives by vastly superior numbers, so around this time I suggested to E-Male in Team Speak that maybe we should do a "strategic withdrawal" ;) to another part of the map where a force of our size (I think around 3 squads at the time) could be more productive. 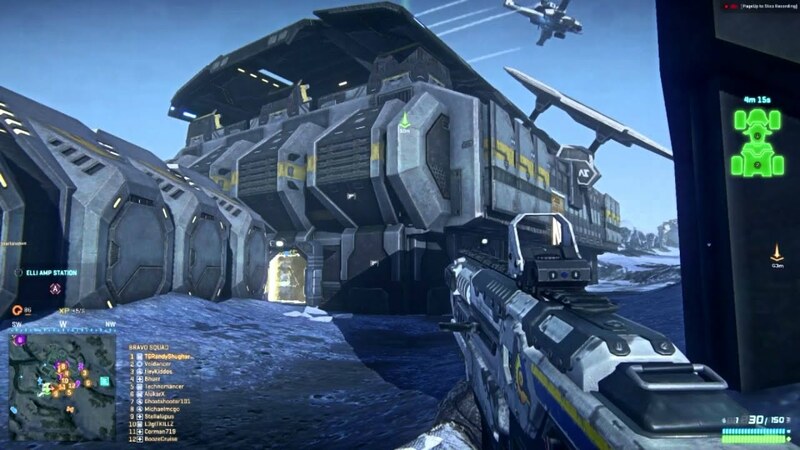 05:31-07:00 We redeployed to the Bulwark, taking it easily and then we moved into position to begin aiding our allies who were already assaulting the Eli Amp Station. 07:00-07:58 We take the eastern outer satellite base at Eli Amp Station. 07:58-08:23 Note how I use the terrain for cover, making our approach by way of a small ditch running east-west, and keeping my squad together down in the ditch as we move west, eventually arriving at the outer walls of the Amp Station itself. 08:23-10:03 We come in contact and fight our way into the gate and around the corner inside where we set up shop behind a shipping container and begin to fire across the open area toward the main building to our northwest, using the shipping container and one of the shield generator buildings to provide cover. Now an important side note, I learned something here, from the perspective of the defender. I have done those Max crashes before in an Amp station using the tunnels. 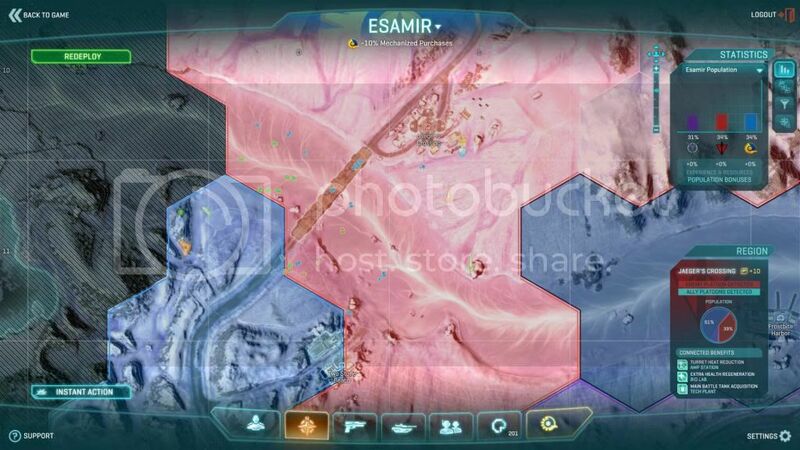 Speed of organizing it is key as always but I would say to do so in the spawn room, then when it is all together get in the tunnels and then attack immediately. The longer you dally in the tunnels under the SCU room before going up, allows the defenders time to realize what is going on and you lose the element of surprise. 12:46-13:44 We cannot congratulate ourselves on the victory at the Amp Station for too long as the Bulwark back behind us to the east has been taken back by the TR already. I deploy our squad on top of a hill with a good firing position down onto their spawn point. What was not shown was at another point where we were also fighting at The Pit, I think it was earlier in the evening and not the same battle. We had turned the flag and were just waiting to cap. My Bravo squad was positioned at the top of the ridge on the east side, set up to fire down into the base as it is in a big hole. 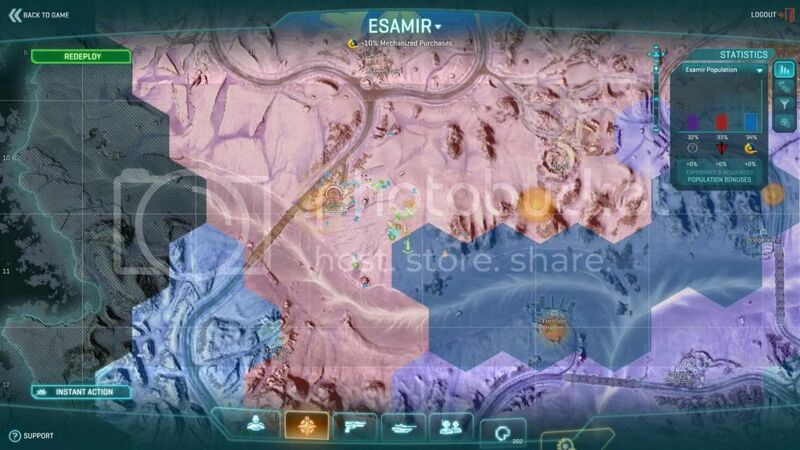 We were positioned with a good view between the spawn and the flag. 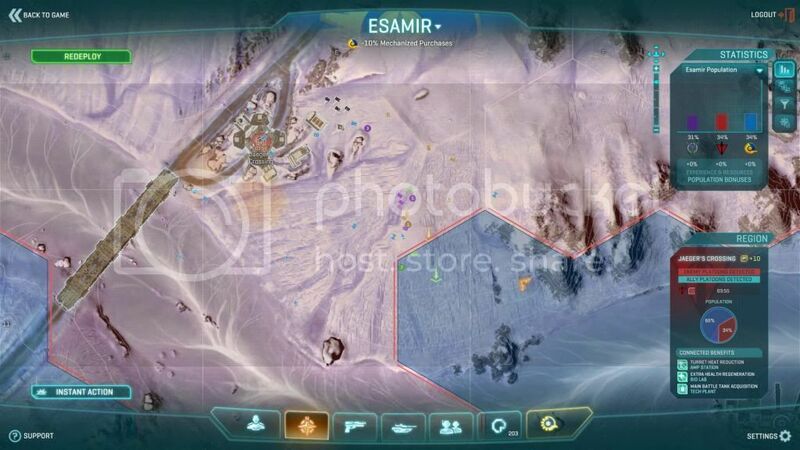 I am pretty sure at least one or two other squads were also set up in this way at various points around the upper rim, with maybe one squad or parts of some squads actually down in the base proper. The timer was just about finished it seemed, all enemies had been eliminated and we were just kind of waiting around. Several infantry started coming out of the spawn, first a squad, then two and then all of a sudden the spawn building began puking out a massive red tide upon us. There must have been platoons of them. Even though we had advantageous firing positions, there were just too many of them. One thing I will say is that you know it when BWC / TE / Buzz Lightyear roll on you, because they come in great force of numbers, and suddenly. I don't like it when it happens to us, but as a good warrior I do try to study my enemy and learn from them. Hmm, not sure why that posted as a link, instead of a video? Although BigGaayAl floated an interesting idea after I posted up the YouTube video of us clomping around the countryside and Max crash for his AAR. He said to start a twitch.tv account and he thought maybe they retain the videos for a few days. If this were true, that would be perfect as you could just keep it running whenever you were playing, and then if anything interesting happened you could maybe download or take that portion of the video or screencaps and post it to an AAR. I have not had a chance to look into it yet, but I am pretty sure I will as soon as I get some time. Thank you! I'm very pleased you had a positive experience doing that. THe reason I started posting about this is exactly because it is in my opinion more effective, AND more fun. This game like no other I've played can make use of the bas of fire principles. 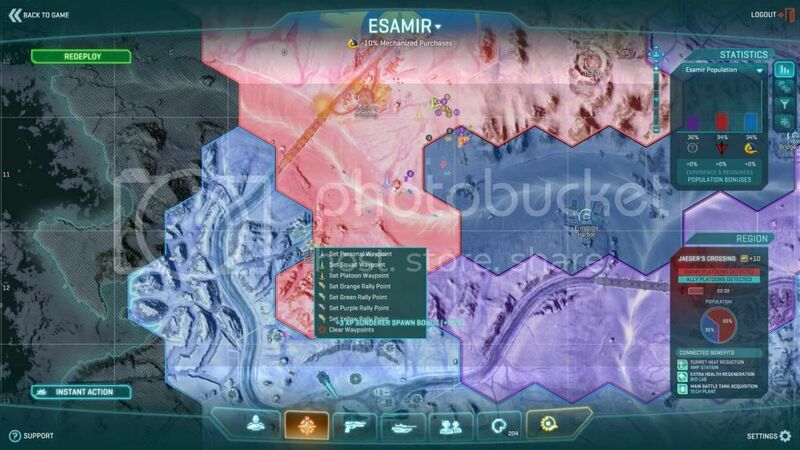 When you get multiple squads doing this, you have this combination of firepower, with mobility as well. It definitely saves all your videos for a few days, deletes them after be default, but you can request any video to be saved indefinitely. You can also post links to specific parts in the broadcast. It is the way recording will be done in the future I think. Unless you want to edit the videos off course. Then it might be preferential to have em on disk. But even for editing, you can download the video from twitch I believe. Having training videos online would be a great Idea imo. Imagine having all SOPs in video format. People would stumble on to it, get interested if it is their style, and then they can join us, knowing IN ADVANCE our SOP's. Wouldn't that be marvelous! Last edited by BigGaayAl; 04-26-2013, 03:48 PM. I think I will sign up for a twitch.tv account at some point and do some experimenting with it. I will report back my findings.